Your brand new patio has had a dose of the good old english weather and now looks like a green, mossy, algae covered mess. Spring is approaching and you really want it to look good as new again. On this page we look at the procedures to take to give your patio that much needed spring clean and then methods of preventing, or limiting, this happening again. Using a pressure washer, give the paving a good blast of water. Be careful not to blast the joints too much or they may start to break down. Use Lithofin - MN Outdoor Cleaner to clean the slabs. Apply with a sprayer and then leave for between 2 - 10 hours. The surface can then be brushed, as per the guidelines but we gave it another blast from our pressure washer. This step can be repeated if necessary. Treat the paving with Lithofin - Algex - Moss and Mould Remover. This has a penetrative effect that not only breaks down moss and mould it also helps prevent it for up to one year. Sealing the paving is optional and up to the user. One of the market leaders is Lithofin - Stain Stop. The impregnator provides optimal protection for absorbent natural and artificial stone surfaces, setting the standard in protection levels. It mostly prevents oil, water and grease penetration and simplifies maintenance. A cheaper alternative to this is Geofix Natural Stone Protector which works well on sandstone paving inparticular. Hopefully by now your patio should be looking like its former self and ready to enjoy your time outdoors on it. Driveways always get plenty of ware and tare. It may be the turning of the wheels on cars causing rubber marks, builders sloshing cement where they should be or just mother nature trying to take the land back. Whatever it may be there is always a time when a driveway need a bit of tender loving care. Below we will go through some simple steps to help you get your driveway back to its former self. 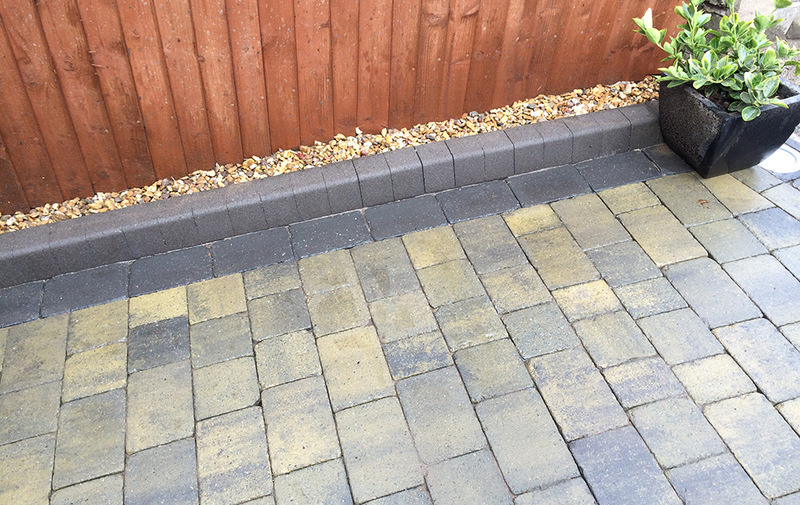 Using a pressure washer, give the paving a good blast of water with a pressure washer. If kiln dry sand has been put between the joints then you may get some sand coming out. Don't be alarmed, we will replace this later. The aim is to clean the tops of the blocks and clean the joints of all microbes that can cause plant growth. You have to be quite methodical for this job, we found the best was to do one row of blocks at a time. Only move to the next row once completely satisfied with the first. The driveway below took 3 hours for 50m2. We would advise that water proof clothing be worn, a face mask is optional, but eye protection is essential. Be prepared to get very dirty. It is best to move as much as possible out of the way as the dirt gets absolutely everywhere. When you finally finish, it is a good idea to let the area dry and then it is much easier to see if you have missed any areas. There were some streak marks left on this driveway, hardly noticable, but would annoy the perfectionist! Using Jointex - Bio Sand, a joint stabalising alkali sand, brush this in between the joints of the block paving. Seal the slabs using either hardseal or cementone pave shield.